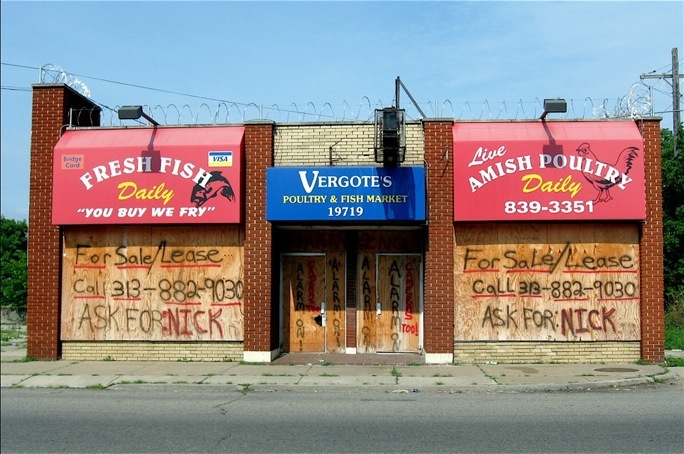 As I wrote a few months ago in my blog entry – Amusing Signs of Detroit – Detroit neighborhoods and commercial strips have plenty of amusing and quirky signs. Several I’ve come across while riding in this city have misspelled words or no punctuation, and some are just hard to figure out. Others are difficult to read because the letters have sagged or dripped because the paint had run before they had a chance to dry. 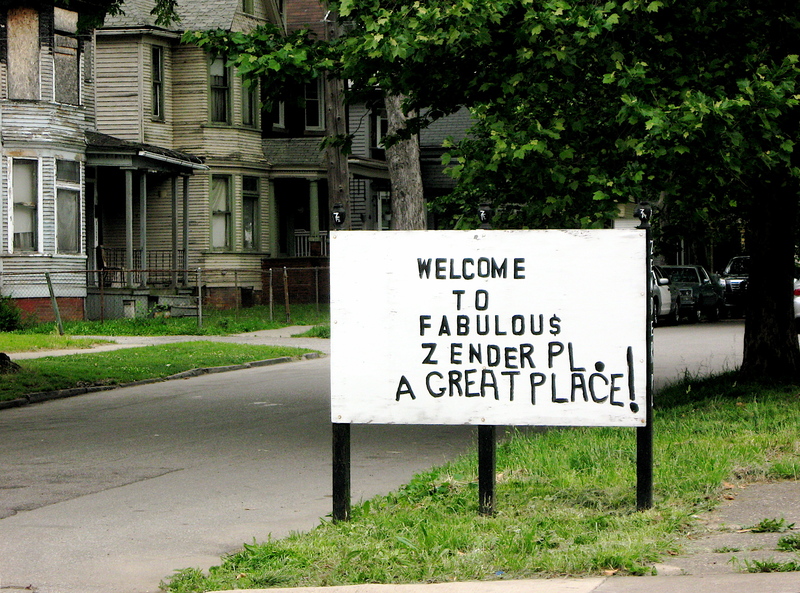 A few I’ve spotted while cycling throughout Detroit are professionally made and yet still have typos. 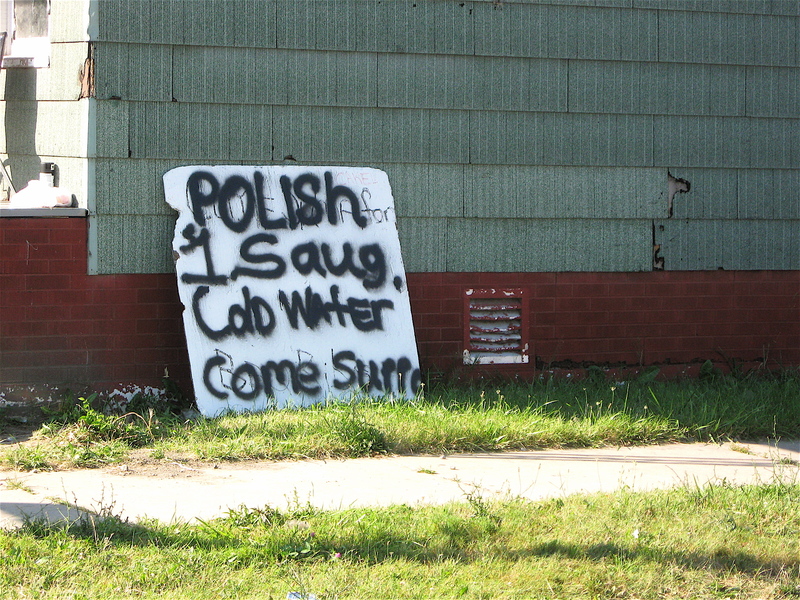 I admire the entrepreneurial spirit and pride that goes into the many odd signs I see, and I’m especially fond of those found leaning on a fire hydrant, stop sign or nailed haphazardly to a side of a building. 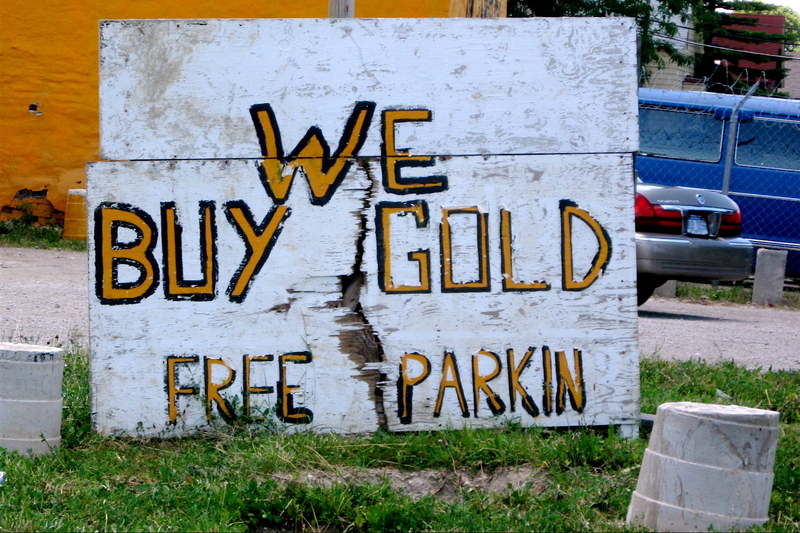 I’ll continue to share the amusing signs I stumble upon on my two-wheel travels. 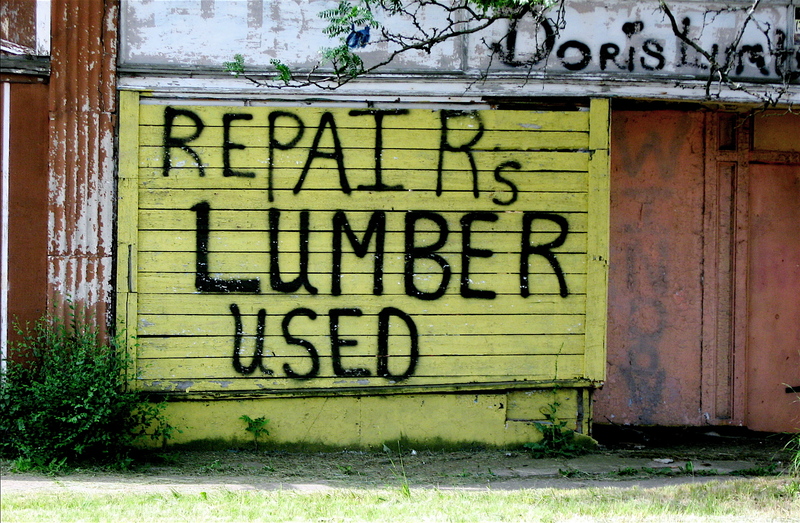 I guess there’s no spell check on a paint can. 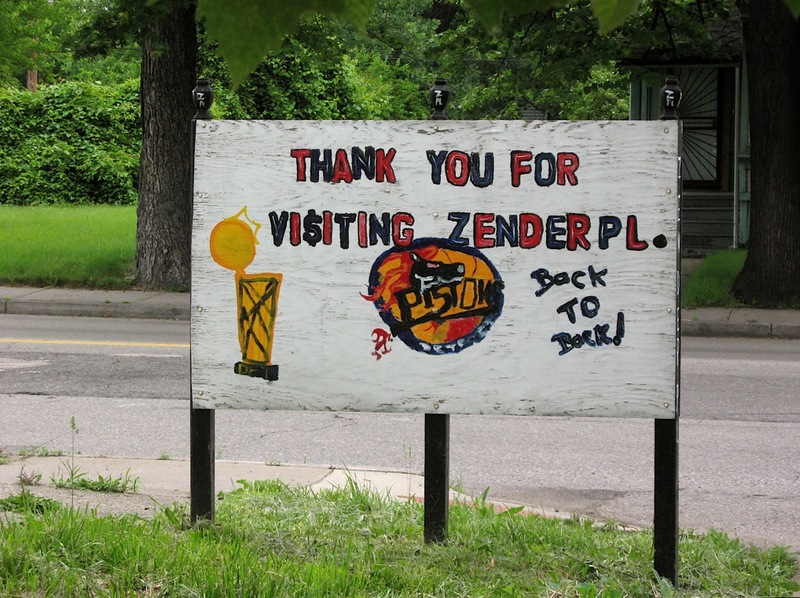 This entry on Amusing Signs in Detroit is part of an ongoing series. To view the others in this series, simply click on the one of the headlines below. Written in 1939 near the end of the depression, this satire on Hollywood’s film industry follows the life of Tod Hackett, a movie set backdrop painter who is also working on an apocalyptic painting – “Hollywood in Flames”. He aligns himself with assorted characters on society’s fringe that have migrated to Hollywood in search of fame. He meets and falls in love with Faye, a young “starlet”, who was raised by her father, a washed-up vaudeville clown who now peddles silver polish door-to-door. Although she spurns him, Tod doesn’t give up on her. Through his quest to win her over, he’s introduced to a cast of second-rate actors and other crude, screwball outcasts living on Hollywood’s edge. 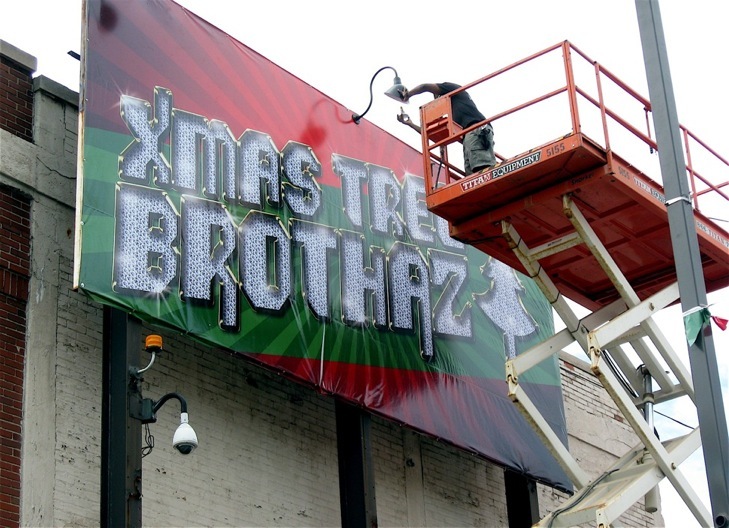 They include a screenwriter who has a dead horse sculpture in his swimming pool; Miguel, a Mexican that trains fighting chickens; a fiery, drunken dwarf; and Homer Simpson, a bookkeeper from Iowa just to name a few. I found it interesting that Matt Groening, creator of “The Simsons”, got the main character’s name from this novel. West has a clean, concise writing style that reminded me of Raymond Carver. The neatness and his choice of words created strong visuals without a lot of unnecessary hyperbole. The character development was tight and the descriptions of their seedy environment, personalities and lifestyle drew me into their sparse, dysfunctional world where the characters are out for themselves, no matter the cost. I found myself laughing out loud at the antics and situations these characters found themselves in. At other times, I couldn’t help but feel sad and quite sorry for these hapless characters that have built their detached lives on Hollywood dreams that will never come to light. I highly recommend this small, amusing 200-page book. It is well written and the characters so fresh and engaging that I read it twice over an eight week period. After all, how could one not love the visual image, such as the one below, found throughout West’s writing? Continuing on Eastwood I crossed Gratiot to Schoenherr Road and took a right to State Fair. Once there, I headed west on my ride to Woodward Avenue. State Fair is mostly residential and although there were signs of decay, most of the homes were well maintained and cared for. Near Hoover Street (M-97), State Fair ends, and I had to work my way around an industrial park to East Outer Drive, which State Fair merged into. This stretch of Outer Drive has beautiful brick homes, nice wide lanes and a boulevard… perfect for riding. 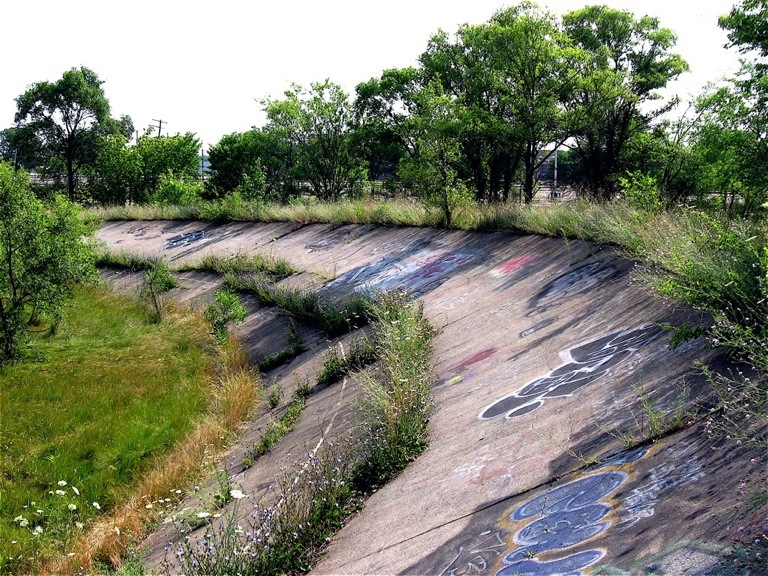 At Outer Drive and Mound Road is Dorais Park, once home to Detroit’s Soap Box Derby hill (built in 1956) and the Dorais Velodrome cycling track, both long abandoned. There were a few remnants of the Soap Box Derby staging area on top of the hill, but the hill itself is nothing more than a field. The 1/4-mile weed choked, graffiti covered Velodrome track is still there. Built in 1969 for the cycling nationals, it closed in the late 80’s. Since the cement track looked to be in okay shape, I rode a lap and was surprised at how steep the 26-degree banks were. I’m sure I didn’t set any speed records. I continued west to Dequindre Street where East Outer Drive becomes State Fair and eventually runs parallel to the Michigan State Fairgrounds. Across from the grounds is a city block surrounded by a 6’ privacy fence. 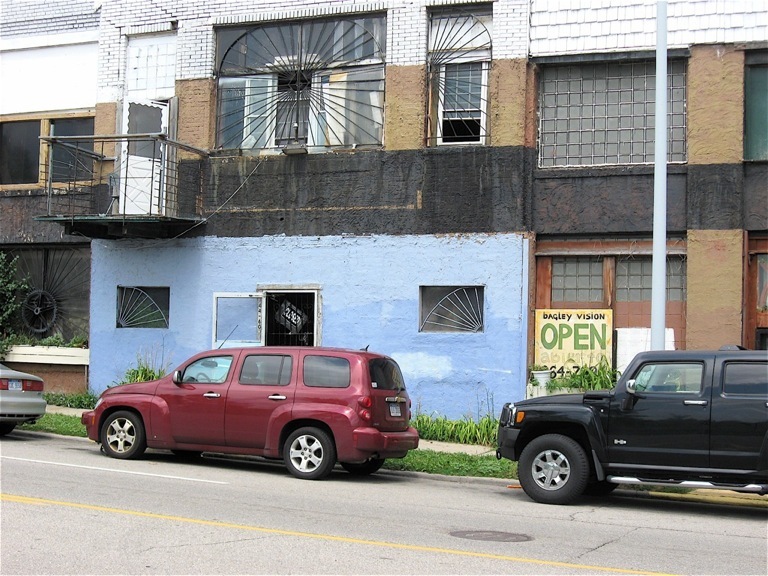 Behind the fence is home to the Theater Bizarre, the site of Detroit’s biggest and most extravagant Halloween Party. It was quiet as I rode by, but I could see through the cracks in the fence what appeared to be haunted houses, the main stage and other assorted theatrical props. It’s quite a setup for one night of fun. Shortly after, I crossed Woodward and headed south through Highland Park on my way to Mack Avenue for my ride home. 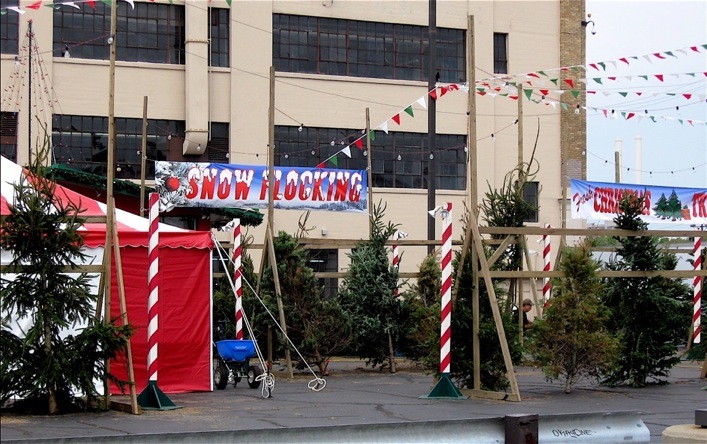 A few blocks past the New Center I came across a full-blown Christmas tree lot, a true “Christmas in July”. It was a bit odd. Here I was, a sweaty bicyclist having ridden 15 or so miles in the July heat only to discover Christmas trees! 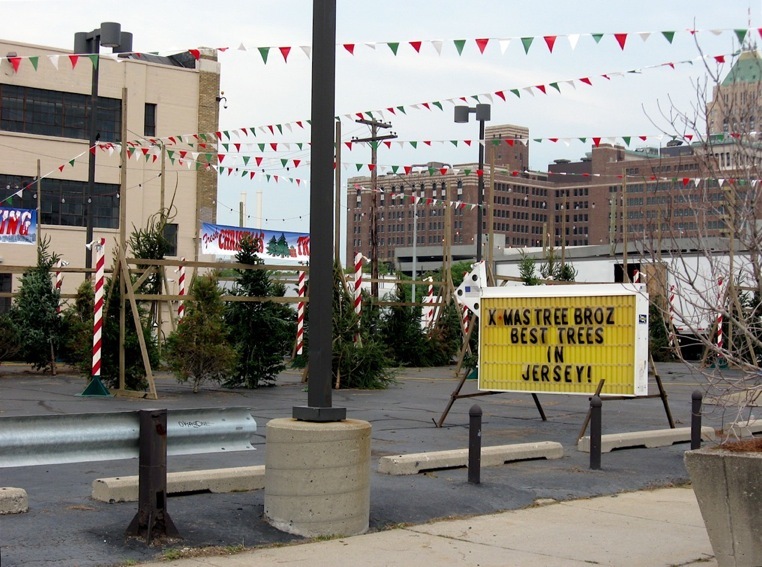 Not only were they selling Christmas trees, they were selling them from a Jersey lot. Based on what I saw being unloaded from the white semi trucks parked along Woodward, it was obvious to me that this was a movie set. 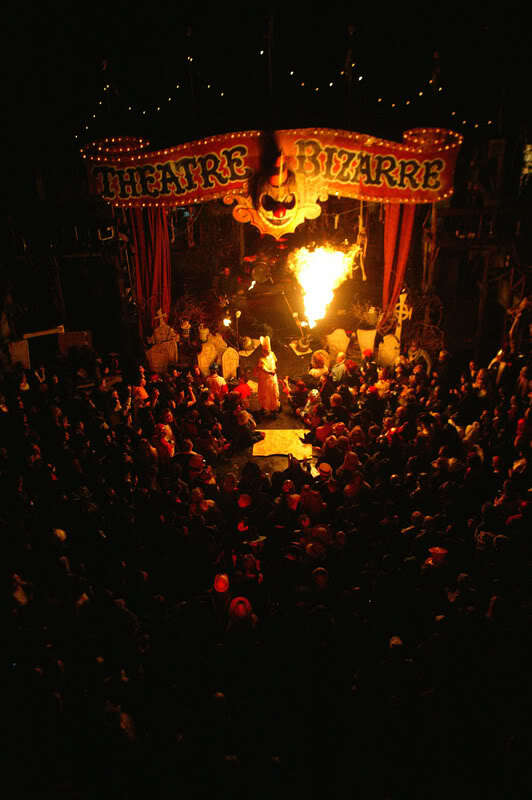 Note – The Theater Bizarre photo is from their MySpace page and no credit is listed. As I wrote last week, in late June I had the opportunity to cycle in Detroit with Rudolf v. Waldenfels, a veteran journalist and author from Germany. He was in town working on a feature story about Detroit. This entry chronicles the second day of our two-day cycling tour. 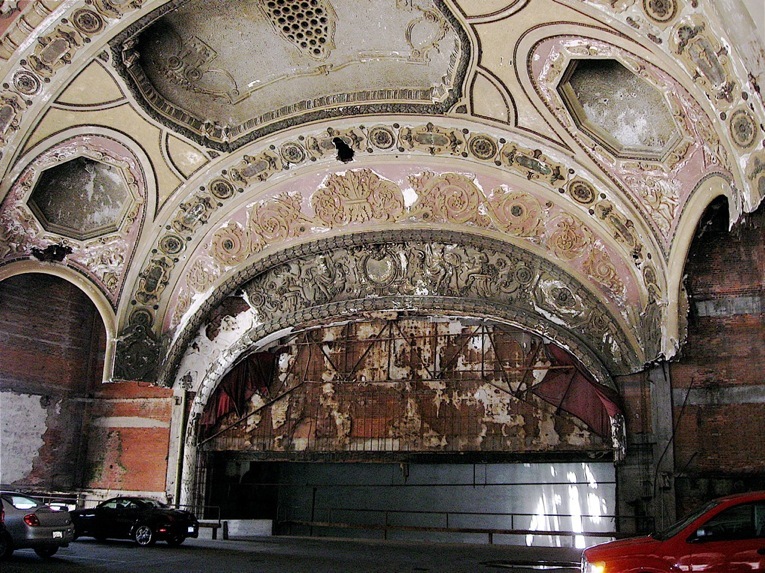 On day two we met near Campus Martius in Downtown Detroit and Rudolf mentioned that someone told him about the Michigan Theater, a 1926 French Renaissance gem that has been converted to a parking structure. 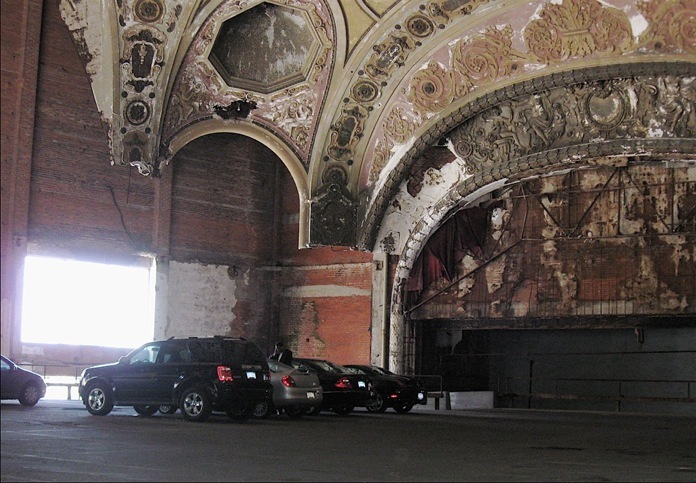 “Is it true you have this beautiful theater that is now a place for cars?” he asked as we pedaled to the theater. After a brief conversation, out he came saying we had 5-minutes to explore. 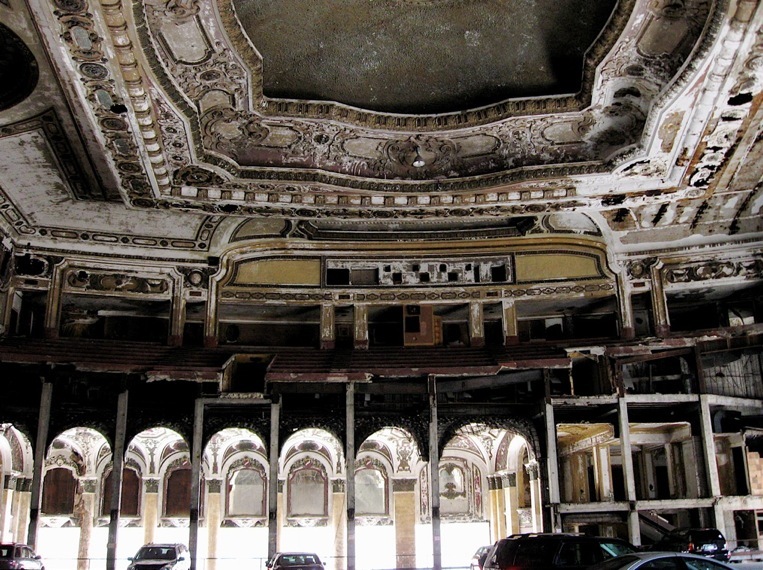 Upon entering the once magnificent theater, we were both speechless. 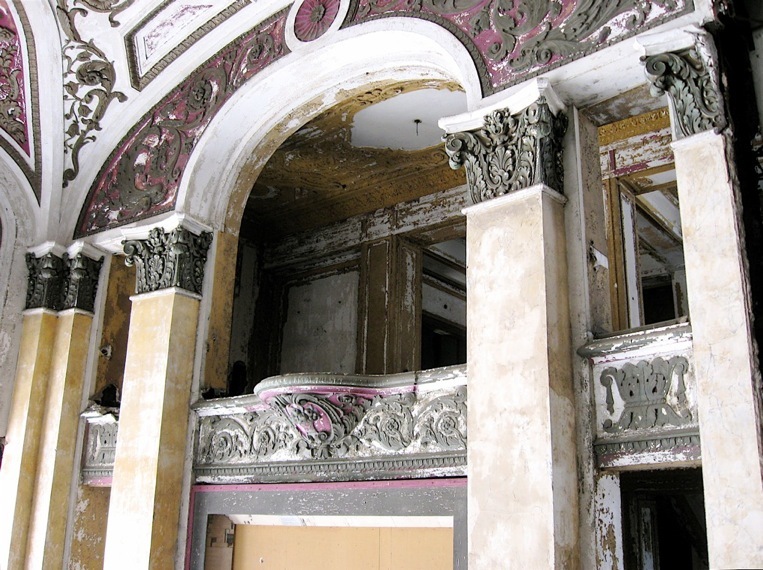 Here was a theater with much of its ornate ceiling, proscenium (arch) and upper level seating areas with marble columns still intact. Below in an area that we assumed to be the main seating area, were cars parked on an asphalt surface. 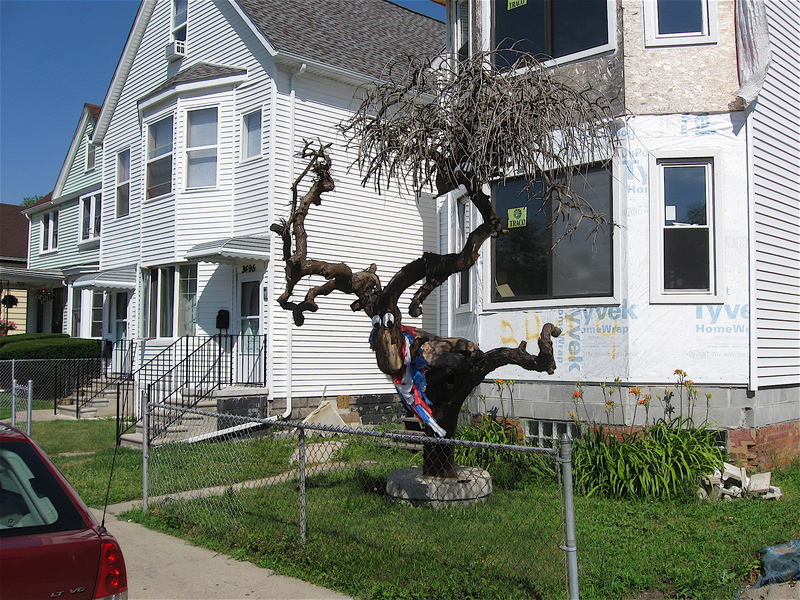 “Unfortunately, this is so Detroit and Detroit doesn’t have much respect for history or preserving historic structures,” I said. “This is surreal. Look, the stage curtains are still hanging,” said Rudolf as he was taking numerous photos. Leaving the theater, we headed to Lafayette Bait and Tackle, a shop that has been in business near the Ambassador Bridge for 60+ years. Our route took us through Corktown, Detroit’s oldest neighborhood, to Bagley Street where we stopped at Bagley Vision near 14th Street, another longtime Detroit business. 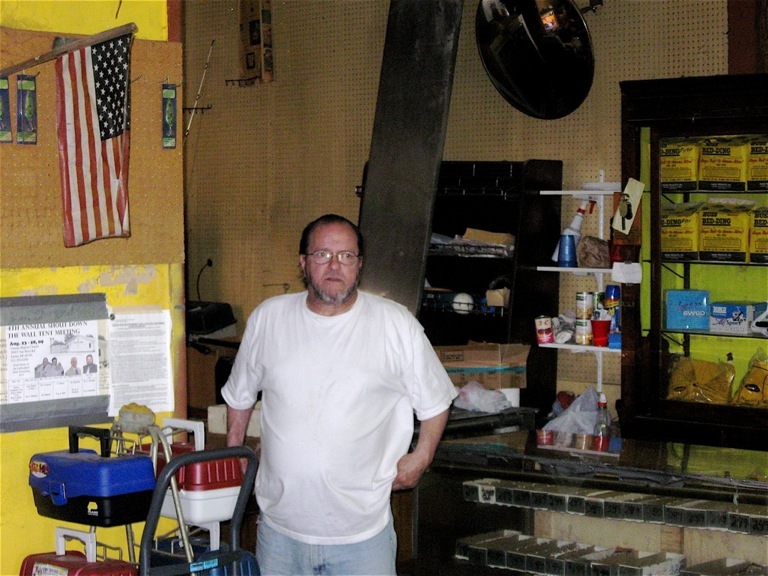 We spent time there talking with George Ondick, a colorful character who has owned and operated the business in a loft-like setting for close to 50 years. Some of the vintage frames seemed as if they’ve been there since day one. He gave us a detailed history of the building – including a tour of his living space. Quite opinionated, the 73-year-old Ondick didn’t hold back when offering his view on crime, running a business in Detroit and the root cause for the city’s decline. The more questions Rudolf asked of him, the more animated, louder and entertaining Ondick became. I could tell he had an audience with this foreign journalist. 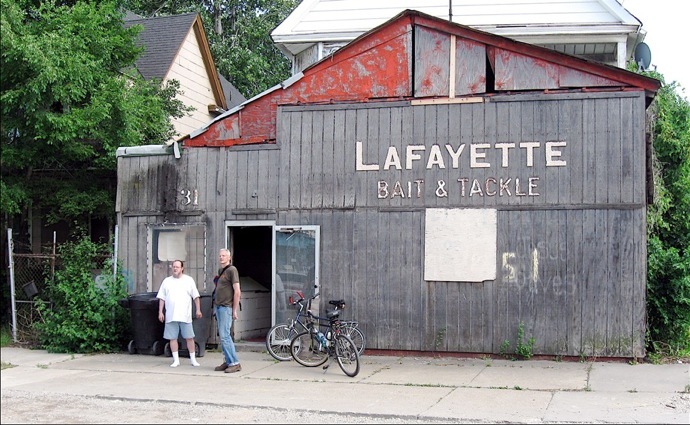 After finishing a can of Vernor’s (a first for Rudolf) Ondick had given us, we headed to Lafayette Bait and Tackle. We crossed I-75 via the new Mexicantown Bagley pedestrian bridge, made our way through Mexicantown and pedaled down a tidy side street to the intersection of West Grand Boulevard and I-75. There Rudolf spotted a directional sign pointing to the bait shop. We weaved our way across the busy intersection and entered a partially paved 1/2-mile lane lined with cement barriers, topped with a chain link fence. Like the interior of the Michigan Theater, it was a surreal experience. Here we were, riding in this one lane passage surrounded by a sea of cement, tollbooths, a U.S. Customs station and overhead highways feeding onto and off of the Ambassador Bridge leading to Canada. 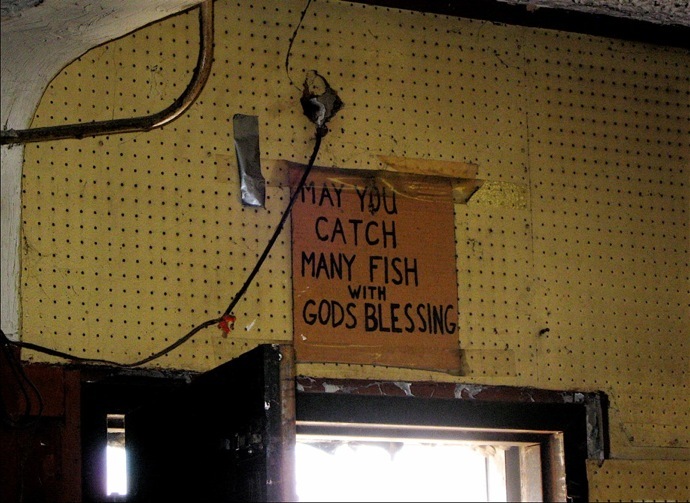 Lafayette Bait and Tackle is at the end of the lane in a building reminiscent of an out-of-the-way country store. Dean Aytes as been running the small shop for the past 20 years, and it’s been in his wife’s family for over 60. For the past 10 years his landlord has fought developer Matty Moroun to keep the property. Moroun needs the land to complete a second bridge across the Detroit River to Canada should permission be granted to build it. Upon entering the store we introduced ourselves, and Rudolf told him that his plight has been documented in various German news outlets. “Yes,” said Rudolf pulling out his iPhone to show him the story via the web. 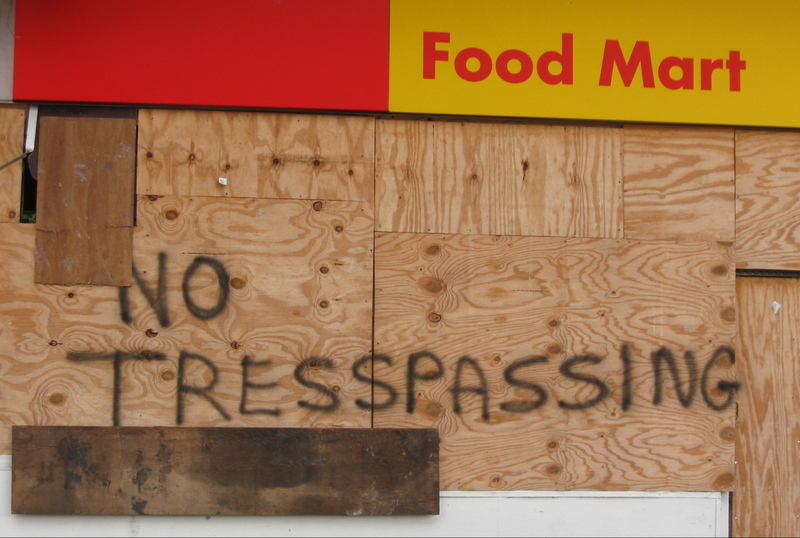 Aytes then filled us in on the history of the place, what the neighborhood was like before the bridge construction, the ongoing court battle and how he’s basically isolated on an island of concrete that has caused business to fall by over 50 percent. “Pay me a fair price and I’ll leave,” said Aytes. “What is it like living here?” asked Rudolf. “As you see, we’re the only ones left. It’s noisy, traffic runs all the time, night and day, but we’re used to it.” Aytes said. “Where else can I go? This is my livelihood,” he added. We exited through the lane to West Grand Boulevard and crossed over I-75. The noise level, construction barrels, flashing arrows and the sheer amount of trucks and cars vying for position on the narrow streets leading to the Bridge ramps overwhelmed us. “I agree it’s sensory overload isn’t it?” I yelled out while dealing with traffic. Once past West Vernor Highway, the Blvd. traffic lightened, and we enjoyed a leisurely ride to the Woodbridge Pub. Along the way we discussed our time together cycling in Detroit and his impressions of the city. He said he was struck by the divide between the rich and poor, the surrealism of the abandonment, our high tolerance of crime, the pretentious lifestyle of the wealthy and our need for material things. And so ends two days of riding in Detroit with journalist Rudolf v. Waldenfels. 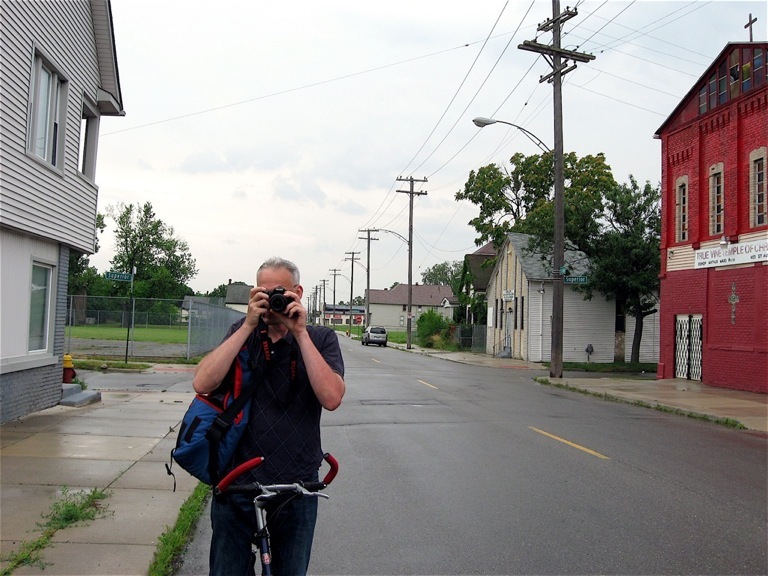 In late June I had the opportunity to cycle in Detroit with Rudolf v. Waldenfels, a journalist from Germany who was in town for a week or so working on a feature story about Detroit. I met Rudolf at a political “meet and greet” for a state senate candidate. He mentioned that he had ridden a bicycle throughout Asia. 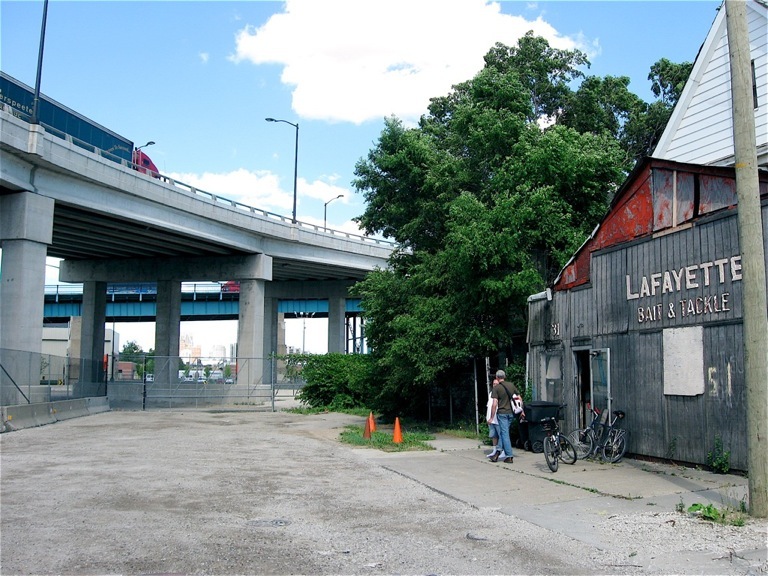 That sparked a conversation about bicycling in Detroit, and I mentioned this blog. He called me the next day, said he’d read my blog and wanted to know if I was available to cycle through Detroit. We met at the Wheelhouse on Detroit’s Riverfront later that day. Upon meeting him there, it began to rain quite hard. We took advantage of the 20-minute downpour by talking about what he’s seen so far, where he’s been and areas of interest he’d like to visit. 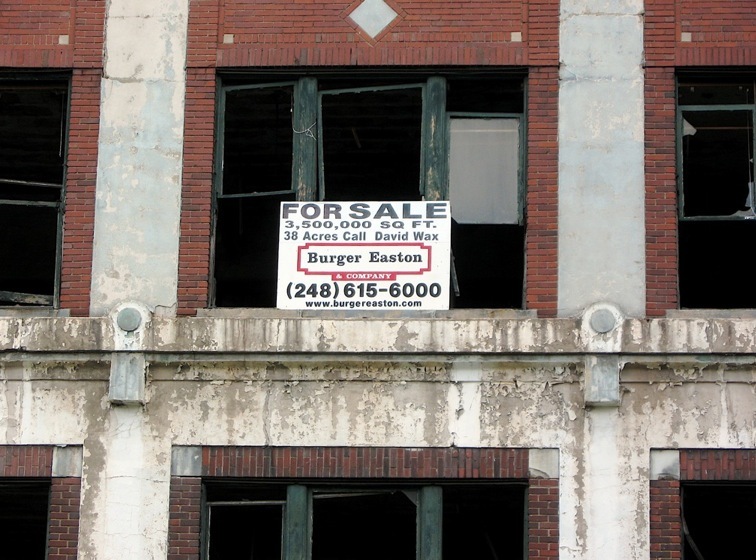 He had already been to Eastern Market, the abandoned train station, Lakeshore Drive in Grosse Pointe and other parts of the city. Based on that discussion, I wanted to give him a balanced picture of the city, and show him some places he might not otherwise see. Once it stopped raining we ventured out. Since we were near the Dequindre Cut that is where we began our first 3-hour ride. Riding through there, we stopped briefly under a viaduct to wait out another rain shower. I pointed out some graffiti, and Rudolf didn’t show much interest. He explained that he didn’t want to tour around looking at graffiti because he sees so much of it in Berlin. Next, we crossed Gratiot Avenue and headed up St. Aubin Street. 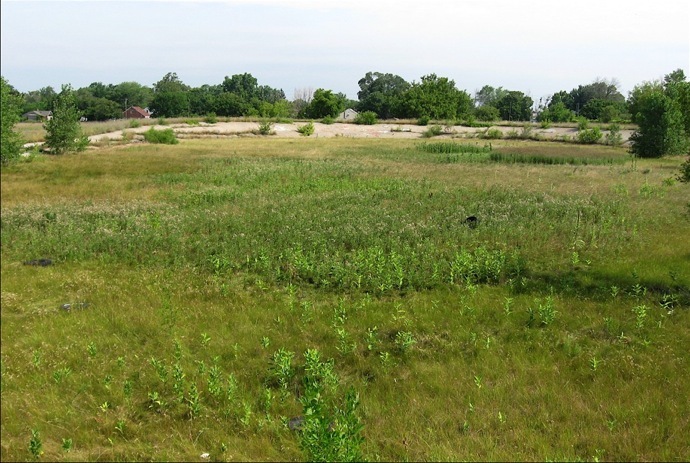 This is a once densely populated area with streets packed full of homes, small businesses and manufacturing facilities that is now mostly lined with vacant lots and fields. As we pedaled along St. Aubin I pointed out some of the unique architectural details found on a few of the remaining early 19th century commercial structures. Rudolf had a keen interest in what I was showing him, and after stopping to take a few photos he suggested I put together organized cycling tours. He said I’d make a good tour guide because of my knowledge and enthusiasm for the city. Hoping to catch some authentic Detroit Blues music we pedaled to the corner of St. Aubin and Frederick Streets – A Field of Blues. Unfortunately, the recent rain showers had moved the starting time back by a couple of hours. That didn’t seem to faze the crowd who were there barbecuing and picnicking while waiting for the first band to set up. 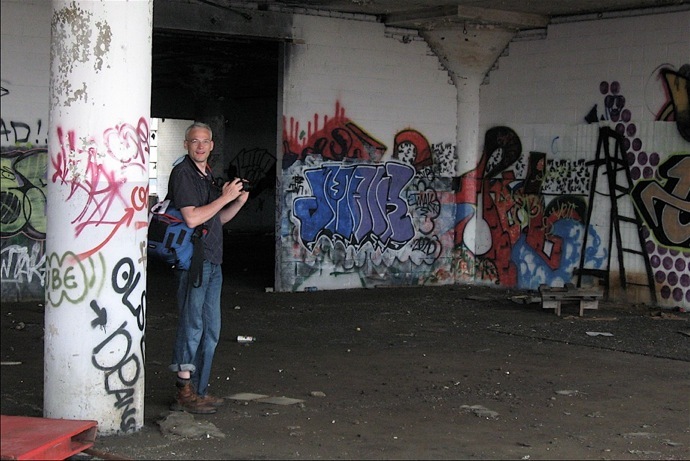 After a slow ride past the field, we left there and headed to one of Detroit’s most famous post-industrial ruins, a 3.5 million square foot abandoned auto factory on East Grand Boulevard. On our way there, Rudolf mentioned that he needed something to eat, so we decided to stop into a corner party store featuring a Subway sign on the outside. We rolled up to the door, and I stayed outside and watched the bikes while he went in. It was kind of a creepy area with unsavory looking people walking around. Although I didn’t feel endangered, the neighborhood was a bit unsettling. “Yes, he said we must leave now.” Rudolf said in a concerned voice. Just outside the industrial ruin we stopped to eat. While eating some pretzels, I asked him what it was like in the store. 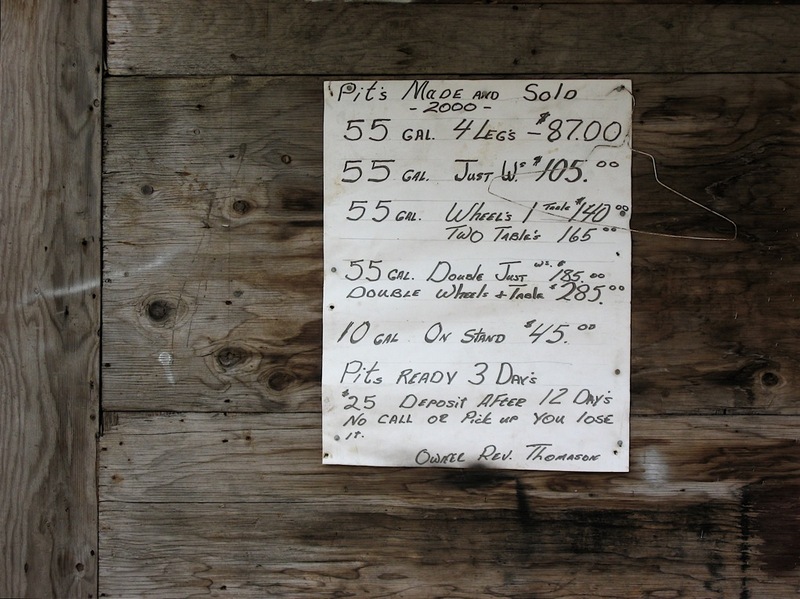 He said they had no sandwiches, mostly liquor, cigarettes and pre-packaged snacks. Just then a family from Brazil pulled up in a car and we struck up a brief conversation with them. In town for the U.S. Social Forum, they heard of the place and were curious of its history. I provided them with a brief overview, but I’m not sure they fully understood because of language differences. 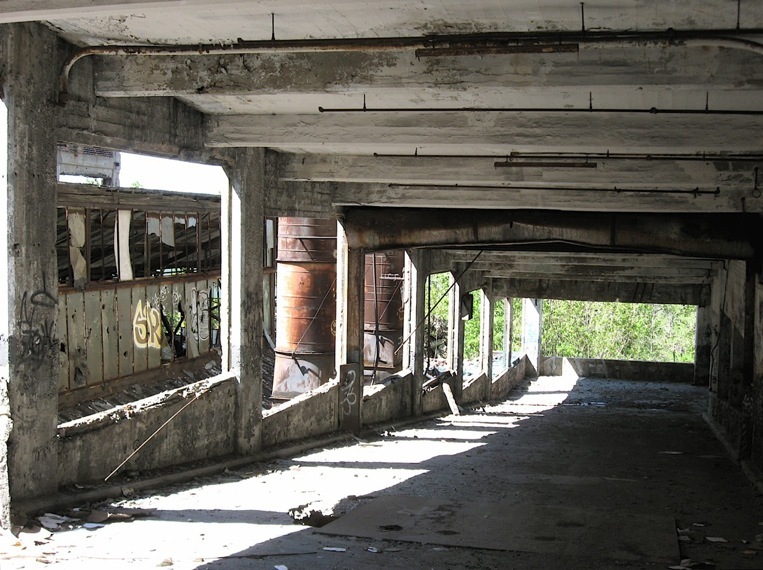 Afterward, Rudolf and I pushed our bikes across broken glass to the rear of the factory and worked our way up the loading ramps to the fourth floor. Once there, we came across a group of urban explorers taking interior photos of graffiti, abandoned boats and vehicles scattered about the building. As we soon found out, the group was part of a photography class run by my neighbor! It was an odd coincidence seeing her there. 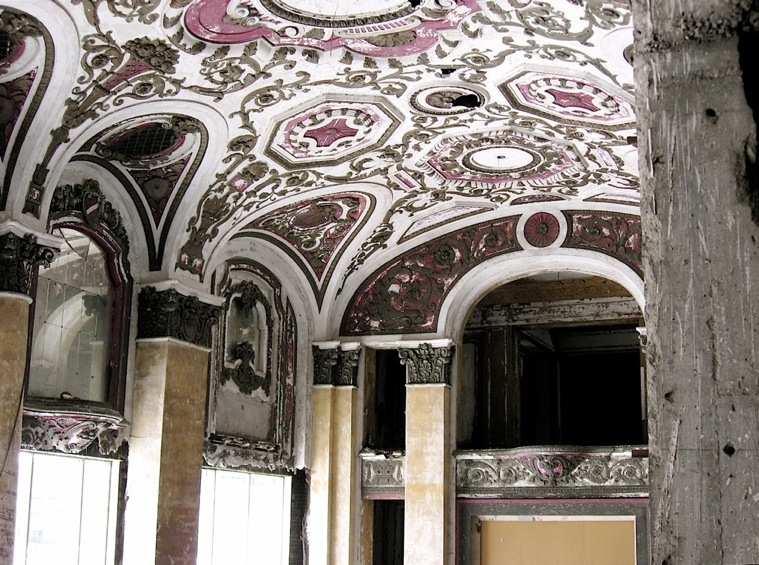 When I asked Rudolf what he thought of this abandonment and the surrounding community, he said, “It’s very surreal.” He didn’t understand how a building this size could fall into such disrepair. He was also intrigued by a graffiti-covered, abandoned truck on the floor and the many derelict boats scattered throughout. As we left the factory, we could hear Blues music from the Field of Blues echoing off the place. So ends day one of our two-day tour.